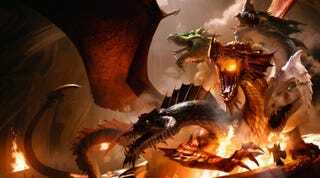 After a two-year development process, Wizards of the Coast has finally announced release dates for the new edition of Dungeons & Dragons. Don your scale mail +1 and memorize your Magic Missile spells — it's going to be a fun summer. Here's what you need to know to get ready. They aren't calling it D&DNext or Fifth Edition. The new book covers simply bear the Dungeons & Dragons title. They've created a new logo, as well — a simple font that lets your attention focus on the famous firebreathing ampersand. It's worth noting that, in the event listing for this year's Gen Con, events running this new edition did refer to it as 5E, which is really necessary to avoid confusion. Why is the 5th Edition of Dungeons & Dragons a big deal? July 15 — Dungeons & Dragons Starter Set, $19.99. August 19 — Player's Handbook, $49.95. August 19 — Hoard of the Dragon Queen, $29.95. September 30 — Monster Manual, $49.95. October 21 — The Rise of Tiamat, $29.95. November 19 — Dungeon Master's Guide, $49.95. The Starter Set, at $20, looks like a great intro product. You get the basic rules, some premade characters, an adventure, character creation rules up to 5th level, and even a set of dice. But the three core books are $50 each, making even one of those a serious stack of clams for a middle schooler who wants to play D&D (and pity the poor kid who wants to be the DM). The people at Wizards of the Coast are pretty great at designing games, but sometimes they're not so great at other things. This makes the decision to license or hire out certain aspects of D&D to people who are experts in those areas particularly interesting. The D&D miniatures line, due out in July, has been licensed to WizKids, who have been making prepainted plastic minis like HeroClix and Mage Knight for over a decade (although random booster packs of minis and another crazy high price point have me scratching my head). Better yet, the marquee adventures coming out alongside the core books were created by Kobold Press, headed up by Wolfgang Baur and Steve Winter. Those are some highly respected names in the RPG world, and I'll have an interview with them about the new adventures later this week. A lot of adults who play (or want to play) D&D have strong nostalgic ties to old editions. The new edition offers those fans some nice shout outs and Easter eggs (notice how the cover of the Starter Set is an homage to the classic Red Box without literally duplicating it, as they did for a 4E starter box? ), but it doesn't get so bogged down in nostalgia that it alienates newcomers or loses sight of what's important, specifically being fun and playable. Elements of the rules, at least as of the last version available for public playtesting, drew on the better aspects of old editions, even the much-maligned 4E. No, you won't be calculating THAC0, but they've worked to capture the feel of classic D&D wherever possible. The biggest North American gaming convention will feature the premier of the Player's Handbook. The last few years, Wizards has put on some impressive parties the Saturday night of the con. This year I noticed that there's a huge hole in their event schedule, with no "5E" events running for a huge block of Saturday night. They haven't announced anything yet, but it looks like something open to fans is in the works.